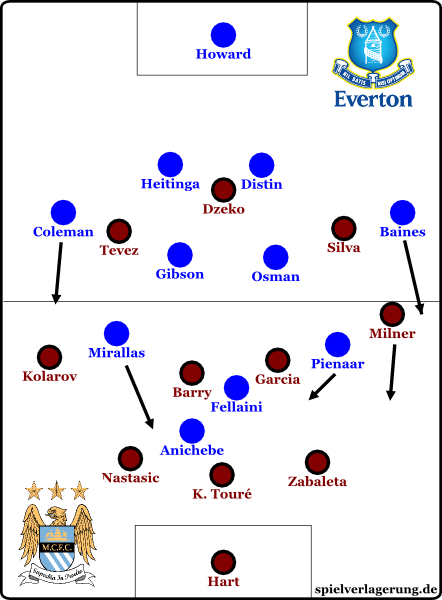 Everton began the game forming their customary 4-4-1-1. Baines and Coleman occupied the flanks of the back four, Distin replaced the injured Jagielka next to Heitinga in the centre. Manager David Moyes had Darron Gibson and Leon Osman occupy the double six, two dynamic players. Phil Neville, who is better technically but less athletic, had to take a seat on the bench. Mirallas and Pienaar worked the wings in attack, switching positions frequently and drifting infield a lot. Everton’s key player Marouane Fellaini played behind Anichebe, who replaced the recently luckless Jelavic. The tall, technically gifted Belgian tried to get balls in the half spaces of the attacking third. His movement frequently poses the question to the opposition if it is better to allow him space or to move a defender up, which naturally opens other space. Roberto Manchini chose a 3-4-3 as the starting formation. Kolo Touré played between Nastasic and Zabaleta in defence, because Vincent Kompany was still injured. Milner and Kolarov stayed relatively deep on the flanks. In and out of possession they acted more like fullbacks. Only Gareth Barry and Javi Garcia were left to constitute the midfield, because Silva, Tevez and Dzeko formed a clear attacking three. Dzeko was the central target man, Tevez worked the left flank and Silva drifted infield from the right flank. During the first minutes, Manchester City had big problems with their build-up. The back three were fanned wide, but the wing-backs Milner and Kolarov did not advance much, at best they stood about ten meters in front of the fanned out centre backs. Everton employed a 4-4-1-1 against the ball. If Barry or Garcia dropped back, Fellaini tracked them. Mirallas and Pienaar blocked Kolarov and Milner. Anichebe was short handed against the three centre backs, but was able to compensate with good runs at the opposition. He did not pressure the player in possession much, but aimed at cutting off connections. He allowed the central player of the back three – mostly Touré – to send the ball to one of the centre backs out wide. Directly after the pass he ran at the outer centre back from the side and denied him the central man as a passing option. The only option was a long foward ball, because Fellaini covered the six closer to the ball and Mirallas and Pienaar were always close to Kolarov and Milner respectively. The forward ball went into the centre, where Dzeko had difficulties to retain possession against Distin and Heitinga, or along the line to one of Tevez or Silva, both weak in the air. So Everton regained possession quickly. During the early game they had up to 70% of possession. Especially missing Kompany hurt City. He could have solved some situations better with his neat passing. With his experience as a defensive midfielder he could also have moved into midfield to open himself to passes in front of defence. Another problem with a back three is that the central player blocks the keeper in a way. Counterpressing? In The Premier League? Pienaar covered Milner with his covering-shadow cone, Anichebe and Fellaini did likewise with their opposition. Baines anticipated the long balls for Milner (green area). For some time now the English league has had to put up with the criticism that its teams’ pressing and counterpressing are not up to date. Today Everton showed counterpressing that was at times well structured and also extremely effective, due to the opponent’s formation. Pienaar and Mirallas pushed Milner and Kolarov so far back, that City was often defending with a bank of five. If City won the ball, Pienaar and Mirallas used their covering-shadow cone well and pressured the flank players of the back three in such a way, that Milner and Kolarov were cut off from service. The two wing-backs could only receive long balls, but Everton smothered even those opportunities with canny behaviour by their fullbacks. Baines and Coleman reacted to the counterpressing movements of their team-mates in attack, instead of keeping an eye on Silva and Tevez. They left Silva and Tevez alone behind their backs, knowing full well that pressure up front was high enough to suppress long, well-aimed balls for the deep lying forwards. An example of counterpressing on the left: Pienaar advanced on Zabaleta, taking Milner into his covering-shadow. Fellaini and Anichebe blocked off the centre backs and defensive midfielders. Zabaleta could only play a long ball. Baines left Silva alone and moved up while Distan drifted wide a little so that Silva was not entirely free. Of course Baines knew of Pienaar’s covering-shadow and so knew that Milner could only receive the ball in a certain area. Baines went there and was able to suppress the away team’s bid for air. The bank of three in defence proved inefficient in build-up and did not work against Everton’s favourite move either. Fellaini drifts towards the left flank and draws one of the centre backs out of position, or else he is easily able to win balls against the right fullback, usually weak in the air. Pienaar cuts inside to work with Fellaini’s passes while Baines runs along the line to give the game width. When Everton tried that move today, City remained a man up in the centre thanks to their bank of three, with Touré and Nastasic against Anichebe. After long balls Zabaleta had no means to compete with Fellaini, who drifted left, problematic for City. The Citizens had huge problems one band further too: Milner had to choose between tracking Piennar, who was cutting inside, and absorbing Baines’ run. Silva, nominally Baines’ opposition, did not work well defensively, so that Milner had to follow Baines and the six closer to the ball had to track Pienaar. Only one of City’s defensive midfielders remained in the middle, allowing Everton to dominate that area. They were able to shift play via Osman and Gibson to Coleman again and again. Especially in early game the Irishman received the ball often, was able to play around Kolarov a number of times and was able to cross dangerously. About fifteen minutes into the game Mancini changed formation to an asymmetrical 4-4-2. Tevez did not work much against Coleman, Milner was pushed back by Baines. After roughly fifteen minutes Mancini changed to a back four. Kolarov defended on the left, Zabaleta right. Baines’ attacking spirit pushed back Milner so far, that the formation continued to resemble a back five. Barry and Garcia were alone against the ball in midfield and could not get a grip on the game. Coleman could be involved even more frequently, because Tevez interpreted his role on the left wing offensively almost exclusively. The unfortunate Garcia and Barry shifted from right to left industriously, but had basically no chance to get a hold of the ball. In attack Dzeko, Tevez and Silva vanished between Everton’s centre backs and defensive midfielders, because they were now sticking close to each other. City clearly was a split team lacking connections to combine well. With Yaya Touré the only player in City’s squad able to create dynamic vertical runs with the ball was missing, adding to the problems. Everton pulled ahead after Osman had scored about half an hour into the game. Due to Barry’s and Garcias’ intense positional shifting the central space before the box was free and Osman steered it home. After that the Toffees retreated. City was allowed to pass the ball around. Everton left the fullbacks free and retreated their two banks of four to the halfway line. 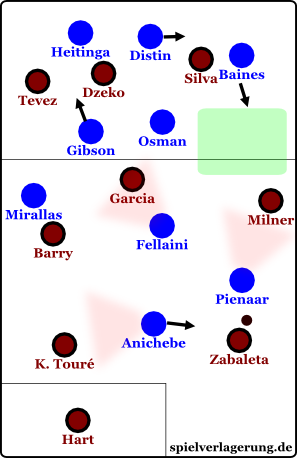 The reigning English champions still failed to connect, because Silva and Tevez rarely moved into the right space. City was unable to create a real scoring opportunity until Pienaar’s sending off in the 61st minute. Everton was dangerous on set pieces, but not as much as usual. 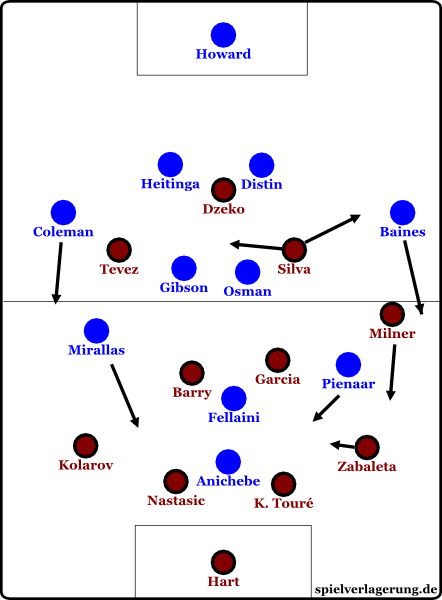 Shortly after Pienaar had been sent off, Osman moved to the left flank, Fellaini formed the double six with Gibson. A little later Moyes replaced Mirallas with Naismith, who is strong defensively. Everton’s 4-4-1 restricted space well, the two wingers were staying narrow. In attack they played the wings in a classical fashion and tried to get crosses, corners or free kicks. Mancini changed his formation too. Samir Nasri replaced the defensive midfielder Barry. The away team played an offensively minded 4-3-3 with Silva and Nasri occupying the half-positions in front of Garcia. Milner attacked on the right, Tevez continued to play left. As the game went on there was more position switching and overloading to be seen. Silva, Milner, Nasri and Tevez rotated and were able to carry the ball into the box a few times. Most of the time they only reached less promising positions on the side of the goal. The channels for passing and shooting were mostly blocked. Everton’s keeper Mucha parried shots from acute angles well during multiple one on one duels. Mancini replaced Touré and Milner with Scott Sinclair and Gael Clichy in the 82nd minute. Clichy played as left-back, Nastasic and Garcia as centre backs. The latter advanced into midfield during possession. Kolarov positioned himself higher up the pitch to grant Tevez a free role and Sinclair occupied the right wing. The drifting Silva and Tevez were able to get a few shots from a distance against the, by now, slightly tired home team. Otherwise they were often floating balls into the box from the half-positions. Dzeko was able to win a few duels in the air, but it is hardly ever possible to add pressure to such crosses. The away team had bad luck when the referee decided on free kick instead of penalty after Fellaini’s handball. In the end the English champions were unable to create clear cut scoring opportunities. Everton defended diligently with their two banks of four and tried to retain possession up front with Anichebe or Jelavic, who was introduced shortly before full time. Seconds before the final whistle Fellaini drove the ball across half the field and sent it to Jelavic. The forward, just introduced, scored a deflected effort and that was the final result. Everton showed an impressive start and ruthlessly exploited their opponent’s inapt formation. Of special interest were the spells of counterpressing. It will be interesting to see how regularly this will be employed going forward. City had problems creating connections between the team’s parts. Very few ambitious passes came from centre, especially Barry and Kolo Touré passed laterally and backwards a lot. The decision to employ a back three did not misfire for the first time. Significant disadvantages against a system with one forward in offence and defence were obvious. Original Text by PP. Translation by FI.